The ability of steam to move equipment has been known about for over 2000 years although its practical use was not appreciated until the 1700s, when a number of different machines were designed to pump water from mines. These engines worked by condensing the steam into water and using the partial vacuum created to draw water along a pipe or move cylinders. 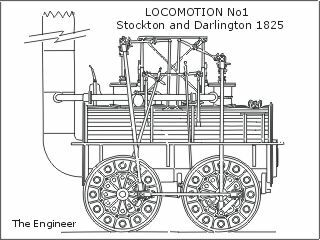 Aptly called, Locomotion No1, Stephenson's first locomotive was designed for the Stockton to Darlington Railway and first appeared in September 1825. The engine had a complicated drive system with the vertical cylinders connected to all four wheels. Although the design included blast pipes, it only had a relatively inefficient, single flue boiler. The Rocket represented a major leap forward in locomotive design. 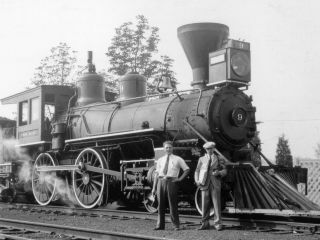 It combined many new features that formed the standard of almost every steam locomotive that followed. The Rocket was the first ever powered, passenger service and was produced at a time when many felt that such a performance could not be achieved. Maximum speeds were increased from around 10 to 37 miles per hour and journeys of 70 miles were completed in a mater of hours. This represented a revolution in travel and was reported on the front page of newspapers around the world. Some 12,000 to 15,000 people turned up to watch the Rocket on each day of the Rainhill trials. 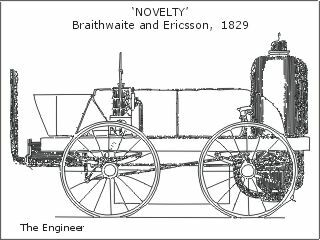 Novelty was the only other engine to compete properly in the Rainhill trials. It also constituted a new concept in locomotive design although one that was never to prove successful. It employed two vertical cylinders and can claim to be the first locomotive to use a double cranked axle. On the day its performance was no match for the Rocket. Although an outstanding success the Rocket was never built in large numbers. The pace of development was so fast that designs were soon modified and improved. 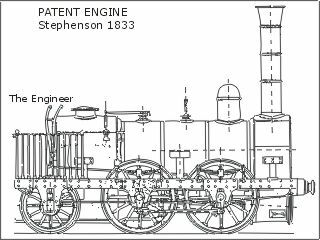 Within a few years the Stephenson's patent engine was widely built by different manufacturers around the world. 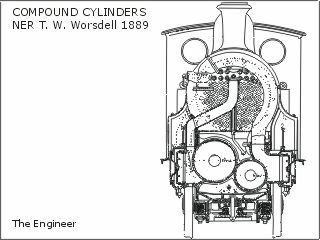 This long boiler design now included larger, horizontal cylinders driving two pairs of linked wheels via a cranked axle. It also had a full smoke box and protective buffers at the front. The Rocket started an explosion of development to produce the fastest and most powerful locomotives. 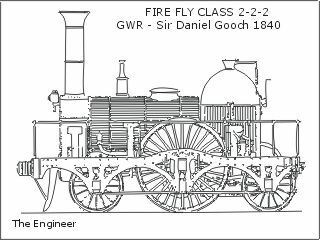 Some of the leading contenders were produced by Brunel's locomotive superintendent, Daniel Gooch. 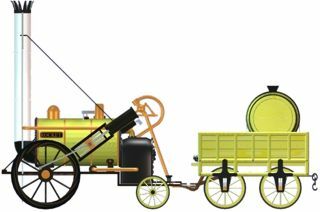 Most engines utilised Stephenson's early designs with a long, multi-tube boiler, inside cylinders driving onto a cranked wheel spindle. Engines around this period also started using cylinder valves that would allow the steam cutoff positions to be adjusted. 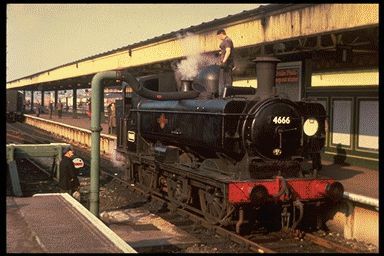 The Firefly benefited from the GWR's 7' track gauge which allowed a stable ride. She managed to achieve speeds of over 60 miles per hour and in 1844 completed a run between London and Exeter in 270 minutes. The demand for faster engines required ever larger boilers and wheels. The maximum size was always limited however, because the larger wheels and cross cranks forced the boiler centre of gravity so high that the locomotive became unstable when running. 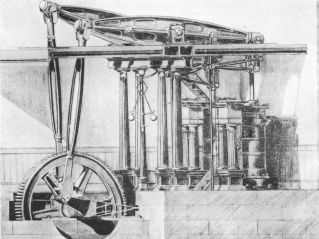 T R Crampton patented an effective solution to this by using a single pair of driving wheels at the rear of the engine and carrying the load of the boiler on 4 smaller wheels. This format proved very popular in France throughout the century and demonstrated that smooth running could be achieved without the need for the wide track gauge. In 1870 a modified Crampton took the world speed record to 89.5 mph while pulling 157 tons. 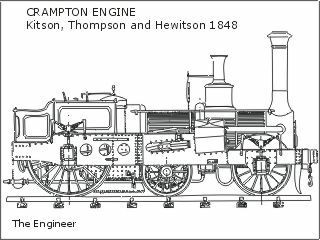 The Crampton originally was built as a '4-2-0' and later models shortly thereafter were also built by choice of the buyer as a '4-2-0'. My notation that they were actually '2+2+2-0' and '2+2+2-0' locomotives is because an actual 4-2-0 and actual 6-2-0 would be with the first axles tandem as a 'truck', or as British call them 'bogie'. In other words, the 4- and 6- would swivel under the locomotive frame independently of the drive wheels. The Crampten leading axles PROBABLY slid side to side laterally to accommodate transverse curves, whereas, probably most British railroads at the time were built on tangents as much as possible, except at turn-outs. North American railways developed slightly differently to European tracks, as their engineers had to compete with more steep gradients and severe curves. Consequently their locomotives were designed with more flexible designs using four wheel swivelling trucks or bogies. Early engines burnt wood and could only manage 40 mph. However they were ideally suited to the rough tracks of the frontier lands where the quest for speed took second place to the cost of building the long lengths of track. 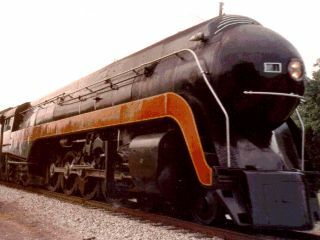 The Norfolk & Western J class (no numeral sub-class like the Y-6b of the same railroad) was built after commercial locomotive manufacture ended for railroads in the USA (1948 the last). The J was built in 1950 with the unique provision that all lubrication was provided from a central reservoir at the front of the locomotive, so that the service crews or locomotive engineers only had to check one location to assess lubrication supply levels. The locomotive also was completely 'rollerized' with Timken roller bearings on everything - axle bearings on locomotive and tender, wheel connecting rod bearings, cylinder guides, etc. That means the locomotive had absolutely no ability to slow the train when running. The train's own brakes slowed the train. The locomotives of the J class reportedly were able to run 500 miles without the engineer needing to check the lubrication levels, which saved time at water stops. Early designers felt that a single pair of driving wheels provided greater running freedom and would therefore allow higher speeds. However, as engine powers increased the limits of adhesion of the steel track against the steel driving wheels soon became a problem that even the introduction of steam sanding valves could not solve. Ever improving manufacturing tolerances, materials and methods of lubrication soon allowed multiple driving wheel layouts to become the norm. The adoption of outside cylinders also allowed the boiler to be lowered to improve stability. In 1895 a new schedule service record was set with an average speed of 67 miles per hour from Crewe to Carlisle. Many different wheel configurations were tried in an attempt to find the best compromise and the number of wheels became an accepted way of classifying the different locomotive designs. The code 2-4-0 means the engine has 2 wheel at the front followed by 4 wheels of a different size. '0' indicates that no other wheels are fitted at the back of the locomotive. Following the Rocket's introduction the only major developments in locomotive design were aimed at improving the overall operating efficiency. One significant technology that was adopted widely throughout the world was based on Alfred de Glehn's success with compound cylinders. This used two stage expansion to provide a more efficient use of steam. The high pressure steam was first fed to a pair of cylinder to provide drive, then, instead of simply exhausting the steam to atmosphere is was fed to a second set of larger cylinders. Although at a lower pressure the exhausted steam still contains energy and this could be extracted by using a larger cylinder designed to work at the lower pressure. Fuel savings of around 20% were possible. This particular locomotive was also one of the first to adopt the soon to become, common design standards of Walschaerts valve gear and boiler pressures up to 214 psi. 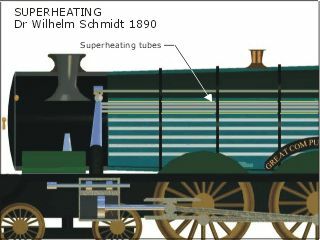 The last significant development to locomotive power was provided by Dr Wilhelm Schmidt of Berlin. His work on superheaters provided real improvements to engine power in the early 1900s. By taking the saturated steam that would normally be passed straight into the cylinders, back into the inside of the hot air pipes coming from the fire, Schmidt managed to achieve an additional heating and expansion of the steam with no corresponding increase in coal usage. This technique provided an increase in power as well as efficiency. Savings of up to 20% were recorded which allowed similar improvements to compounding but without the mechanical complication. The maximum speed and power of an engine is strongly related to how large it can be made. In the chase for speed locomotives gradually became larger and larger. This increase was linked to the standard of each track and more importantly the strength of every bridge on the line. By increasing the number of axles on each locomotive the weight per axle reduced. This was a key figure, along with the total engine weight that decided the size and performance of all new locomotives. In 1926 the GWR Castle Class achieved an average speed world record time on a schedule service between Swindon and Paddington of 81.7 mph. The manufacturing tolerances of any piece of mechanical equipment will have a significant effect on the reliability and performance of that item. This is no different with a steam locomotive and is particularly relevant for the clearances within the cylinders, valves or insulation will have a major effect on amount of steam or heat that is lost. 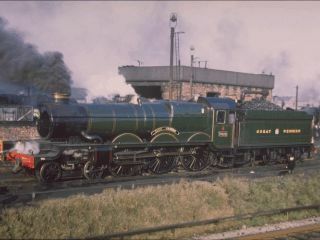 The GWR, Swindon works were renowned for their precision manufacturing and the Castle Class showed a 25 % improvement in coal used per drawbar-horsepower-hour against the standard for the day. 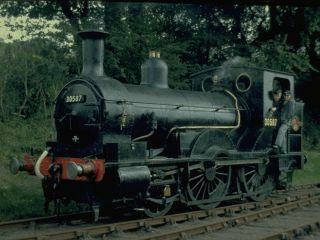 It was often claimed that the standard for limits and fits of some new locomotives was the same as the GWR standards when they were worn out. Their locomotives were certainly noted for their reliability at the time. The American and Canadian 4-8-4s were among some of the largest locomotives to go into regular service. The eight driving wheels allowed a very long boiler and provided plenty of contact to help transmit the power onto the track. The smaller four wheels at the rear of the engine also helped to allow a larger grate area to be built into the firebox. As speeds reached towards 100 miles per hour the wind resistance of the locomotive became important. To achieve the much sought after claim of designing the fastest locomotives, streamlining was vital. 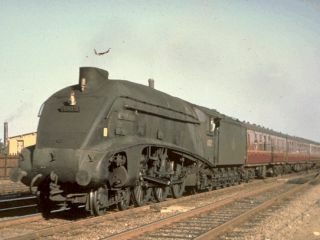 The current outright record in the UK is 126mph held by the Mallard although the Silver Fox set the fastest service run of 113mph in 1936. The days of steam were however, already coming to an end. Too many accidents and deaths had forced the introduction of speed limits in an effort to stop the various companies racing each other to claim the quickest service. The power to weight ratio and much greater efficiency of electric and diesel locomotives was also starting to signal that the days of steam would soon be coming to an end.